Today is July 23. The first day of classes will be August 23. I have exactly one more month remaining of summer vacation 2010. As someone who typically looks at the glass as half empty, my initial reaction to this calendar realization is to become wistful and rather depressed — not because I have to return to the classroom (I actually love teaching – it is the grading that bogs me down), but because I did not accomplish all that I had hoped to do in my twelve week break. However in keeping in step with my new outlook on life — enjoy the journey — I am going to try to focus on the few remaining weeks and make the most of it. I am also trying to train my brain to think realistically – not fatalistically. It would be my normal thought process to convince myself that I will no longer have any time to do things that I want to do because all my time will be spent doing what I have to do. This “all or nothing” attitude is not only inaccurate, it is self-defeating. The truth of the matter is that I will have some free time and if I prioritize and plan, I can purse these creative interests throughout the school year. Isn’t it funny that once you put your mind to something, opportunities seem to magically appear? As many of you know, one of my creative interests this summer has been photography. I recently found Amanda’s blog, Spiral Upward, and have enjoyed her weekly posts that depict her 2010 photo journal. Each day she takes a picture and once a week she posts them with a brief caption. I have thought that this would be a fun idea to try in 2011. Since I have secretly harbored the dream of traveling overseas in my retirement years and documenting the event as Journaling Photos (concentration on writing) rather than Photo Journaling (concentration on photography) – I thought this might be a good interim project. But then….. Yesterday I was reading Susannah Conway’s blog where she has proclaimed August as the month to take a break from blogging and learn to live more in the present through the lens of a camera. I am not sure that I am willing to take a total break from blogging (although my time to write meandering posts will definitely be impacted by the preparation of lesson plans), but I do want to try to challenge myself to document my life (or what matters most to me in life) through pictures. Susannah has even created a Flickr group for participants to share their photos, if they so desire. This should give me an idea if this will be a viable New Year’s resolution, it will allow me to become more familiar with my new camera, and hopefully it will help me to pause and take time to smell the roses. In essence, to capture my new-found mantra, enjoy the journey, through the use of photographs. How about you? Is this something that you might be interested in pursuing? Have you ever done any kind of documentation through photos? I would love to hear your experiences! It sounds like a fascinating project, but I'm not sure my eye is good enough to capture great photos. I have taken monthly breaks from my blog before, mainly due to burn out but I always feel weird about it. This does sound like a fun way to stay fresh though and I wish you luck! Molly, I think that sounds lovely. And I am so glad that you are taking some time to do for you. I think our personalities are very similar from what I've read on your blog and ENJOY THE JOURNEY is a fabulous mantra. 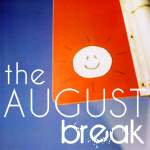 I, too, am taking an August blogging break. I'm going to take the next several weeks to recharge and refuel. I'll still be around some, but I'm not pressuring myself to do anything. I'll be back in the swing of things about Labor Day time. I would love to do this. Especially the part about taking a break from blogging and just taking pictures. I saw Amanda's blog and your name was on the list of participants! What kind of camera do you have? I have a Nikon D40, but I saw pictures of someone who just got a Canon Rebel Ti (is that the name?) and the pictures are gorgeous. She said it's definitely the camera and not her expertise since she's new to photography. I'd like to upgrade, so I was just curious to know what you have. Oops, I mean I saw your name on Susannah Conway's blog, not Amanda's. I think this sounds like a great idea. You get to reinvent your blog and get a fresh perspective in the process. Enjoying the journey is a wonderful mantra, one that we all need to keep in our minds every day. I'm not sure if what I do is journaling through photos, but I do take alot of them. Wordless Wednesdays is my way of using them (I'm way too hyper to scrapbook). Best wishes in your August break, wherever it may lead you, Molly, and, most importantly, enjoy the journey. When I started my blog, I gave myself a personal goal to try to post every day. I'm used to journaling on a regular basis, so, for the most part I have been able to do it. Due to some commitments, however, I needed to give myself permission to take a break or two lately. It was a bit of a challenge for me because I like to write and I need the discipline of doing it on a regular basis. I do find myself wandering our garden on a regular basis, taking pictures of flowers, or golden leaves, and even snow and it has been fun to look back at what I have done. Blogging helps with that as I download (or is it upload – can never remember) them daily and put them in dated files with descriptions, such as garden, coneflowers, moonflower, so that I can find them when I want to use them. I learned that the hard way. I love the idea of Photo Journaling! I can't wait to see what you produce. Molly, this sounds perfect for you!! Enjoy the journey of your new camera. I've posted the occasional photo of walks I've taken–and some for Paris in July, but I am no photographer, and they were hardly a journal. Best of luck to you. Have FUN!!! Enjoy The Journey Molly, and the camera. I'm pretty hopeless with my camera but now and then I fluke it!! I had no idea what I was getting into when I began a blog. I had been doing an art and creativity diploma so that I had something to say when my teaching friends asked me what I did a day now retired!I thought a blog would keep my creativity going. One of the nicest things has been meeting lovely people like Molly! I've always kept visual diaries when travelling. Love this post, Molly. It's so hard not to get caught up in how much time we DON'T have and I fall victim to this a lot. I've been trying really hard not to stress myself out lately about how much I'm posting and more importantly how much I'm commenting. Taking a six month break from blogging really helped with the guilty feeling of not visiting everyone all the time (although I still wish I could). I like the idea of taking pictures and journaling that way. And I don't think you need to give up blogging to do so. I love how Amanda posts her pictures and it also gives us a glimpse into the real life (if you're OK with posting about this). I'm more personal and I like getting personal with other bloggers. I would love to follow your journaling photos, but I find it difficult to get one decent photo a week! I'm not sure I could come up with one a day. I'll think about it. I have a friend who has been doing a picture a day project since beginning of 2010 on her Facebook page. The pictures have been so fascinating and have truly been worth more than words. I would love to follow your photo journal if you choose to do one. I love the idea of journaling through photos….and I love looking at other people's efforts. It's the uploading and messing with Blogger and photos that drives me nuts, LOL. I've been taking a break from my Google Reader and just read this post, but I thought you might be interested in the 26 Things Photographic Scavenger Hunt. You may have heard of it before. Basically, you have a list of 26 words and you take a picture to represent each one. I loved participating in it and thought it might be another photography project you could try!